We also want your trading to be more hassle-free, so after implementing limit+stop order, we provide trailing stop order too. That one is something like your personal clever market overwatch. It does nothing when the market goes up, but when it starts to decline, trailing stop is activated. When the market shifts unfavorably from that point, the order starts selling. 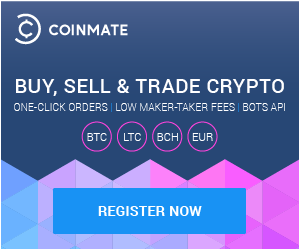 It is a way better tool for protecting your investments on Coinmate. And we didn’t forget bots either. There were many requests for new API functionalities. Dramatic music playing, fast keyboard strokes, coffee machine sounds, here we are with something more for automated trading. We added tradeHistory, transferHistory, and ReplaceOrder to our API methods. Those were the most wanted and we hope they will serve you well. We put our best ones and zeroes there. What do you think? That this is not just a facelift, but a neat upgrade? Absolutely right! And yes, we will keep doing our best for you.